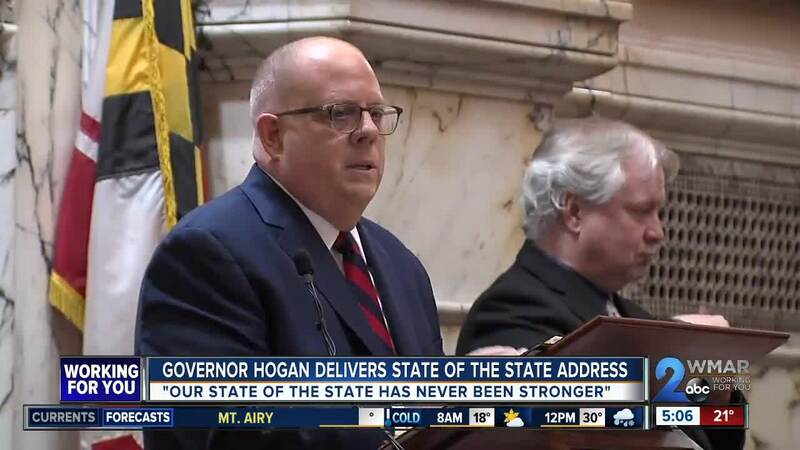 Governor Larry Hogan struck similar tones to his second inaugural address w hile delivering the 2019 State of the State Address in Annapolis Tuesday, trumpeting the cooperative bipartisanship that exists between him, a Republican, and the Democratic-dominated State House. ANNAPOLIS, Md. — Governor Larry Hogan struck similar tones to his second inaugural address while delivering the 2019 State of the State Address in Annapolis Tuesday, trumpeting the cooperative bipartisanship that exists between him, a Republican, and the Democratic-dominated State House. He drew attention to tax cuts, regulatory relief, and balanced budgets, all frequent Republican priorities. But Hogan also boasted of record education funding ($32 billion), focusing economic development in 149 opportunity zones, and environmental priorities, policy typically associated with Democratic ideals. He again championed improvements to the Chesapeake Bay’s waters, a point some state environmentalist might argue with his original stance against the “Rain Tax” and recent reports saying the Bay’s health declined in the past year. Returning money to residents was a theme that dominated the middle portion of his speech. I am humbled to once again stand before this general assembly after four years of bipartisan cooperation and historic progress to report on the state of our great state. Mr. Speaker, thank you for extending the courtesy of allowing me to give this address in the House chamber. President Miller, I can attest to how tough the battle is that you are facing, but I also know your strength and your never-give-up spirit. I want you to know that we are all praying that you come out of this stronger than ever. God bless you. I want to express my appreciation to all the members of the House and the Senate from both sides of the aisle who joined together with us these past four years to change Maryland for the better. At my inauguration in 2015, I said that “the politics that have divided our nation need not divide our state.” I pledged to avoid the extremes of either political party and to instead seek that middle ground where we could all stand together. I believe it is because we kept that promise that I am standing here again today at the start of yet another term. We have spent the past four years working together to tackle our common problems by accepting our shared responsibility to solve them, and we have shown the rest of America that a divided government does not have to be a divisive government. As a young man, I was proud to work for President Ronald Reagan who said: “There is no limit to the amount of good you can do if you don’t care who gets the credit.” I pledged four years ago to “create an environment of trust and cooperation where the best ideas rise to the top based on their merit, regardless of which side of the aisle they come from.” It is that kind of commonsense pragmatism that has guided our path forward. We didn’t demand Republican solutions or Democratic solutions. We sought out bipartisan, commonsense solutions that worked for the people of Maryland. We didn’t demand Republican solutions or Democratic solutions. We did our very best to put the people’s priorities ahead of the current national obsessions with partisanship while striving to change Maryland for the better. As a result of those efforts, I am pleased to report that the state of our state has never been stronger and that the people of Maryland are more encouraged about the direction of our state than they have ever been. We pledged to put more people to work, to grow the private sector, and to turn our economy around - and we have done exactly what we said we would do. The very first budget that I submitted eliminated nearly all of the $5.1 billion structural deficit we inherited, and, in the latest budget I just submitted to you, we have managed to put $1.3 billion into savings for our future needs. Here in Annapolis, we have worked together to pass balanced budgets every single year. Heck, they haven’t passed a budget in Washington since 1996! We cut taxes, tolls, and fees by $1.2 billion, and we put all of that money back into the pockets of struggling Maryland families, retirees, and small businesses and back into our growing economy. We cleared away the tangle of regulatory undergrowth and paved the way for historic economic growth and record job creation. More businesses are open and more people are working than ever before in the history of our state, and we have had one of the best economic turnarounds in America. That success has enabled us to once again provide historic, record funding for education and to fully fund every one of Maryland’s other priorities. It has also made it possible for us to provide additional tax relief to Marylanders who desperately need it the most. We are introducing eight different legislative proposals that will provide more than a half billion dollars in additional tax relief over the next five years. Tax cuts to help retirees who I meet all across the state who say: “I love Maryland, and I don’t want to leave my kids and grandkids, but I can’t afford to stay here on a fixed income.” Tax incentives to help provide paid parental leave for those working parents struggling to live paycheck to paycheck. Tax cuts for the college graduates who worked hard to earn their degree, only to face the harsh reality of crippling student loan debt. And tax breaks for mom-and-pop shops and small business owners who are the backbone of our economy and who are struggling to keep employees on the payroll and keep their doors open. These hard-pressed Marylanders deserve a break for a change. The previous governor said in a State of the State address that Maryland had crumbling roads and bridges and some of the worst traffic congestion in the nation. Well, we decided to finally do something about that.So we are moving forward on nearly all of the highest priority transportation projects in every single jurisdiction all across our state - an unprecedented and historic investment in our transportation infrastructure in both transit and roads. We began construction of the Purple Line, the largest public-private transit project in the nation. We came together with you and our neighbors in the region to finally provide a dedicated source of funding to save the Metro system. After decades of ignoring the problem of traffic congestion, we are making tremendous progress, but much more is still left to be done. So we proposed the largest P3 traffic relief project in the world because Marylanders are sick and tired of spending countless hours of their lives sitting in bumper-to-bumper traffic. Together, we have the opportunity to finally solve that problem for them. We pushed for landmark legislation that cemented our position as a national and international leader in combating greenhouse gas emissions. We expanded the Climate Change Commission and implemented clean air standards that are stronger than 48 other states and nearly twice as strong as the Paris Accord recommendations. This year, let’s work together to enact the “Clean Cars Act” and to support clean and renewable energy solutions and green energy jobs. But let’s ensure that these solutions are affordable and reliable and that they create those jobs right here in Maryland. When it comes to the Chesapeake Bay, we put an end to the practice of raiding billions of dollars from Bay Trust funds. We fully funded all Bay restoration efforts four years in a row and invested $5 billion, the most ever in history. As chairman of the six-state regional commission, the Chesapeake Executive Council, I stood up and led the fight to protect and restore federal funding for the Chesapeake Bay. And after years of the problem being ignored, we are pushing for action to address the problems of the sediment, debris, and pollution coming down the Susquehanna River over the Conowingo Dam and into the Bay. Maryland has made historic progress in Bay restoration, but we can not - and should not - have to do it alone. I intend to keep pushing our upstream neighbors in Pennsylvania and New York to do their fair share to protect this national treasure. For the fifth year in row, my budget provides historic, record-high funding for our schools. We have invested $32 billion in K-12 education. Every single school system in Maryland will again see increased investment by the state. The legislature’s funding formulas call for Baltimore City to receive $11 million less this year in K-12 education funding. And those formulas also call for decreases in funding for other school systems with declining enrollments. Our budget ignores those recommendations and fully restores all of this important funding. More than half of our entire capital budget goes toward education. And the casino lockbox, which we jointly supported, will provide an additional $4.4 billion more for our schools, the majority of which will go directly into the classrooms for critical things like teacher salaries, pre-K expansion, extended academic programming for at-risk students, and innovative career technology education programs. In Maryland, we are proud to have some of the best and most highly funded schools in America. In November, a panel of federal judges unanimously ruled that the boundary lines of Maryland’s 6th Congressional District are unconstitutional and ordered that new electoral lines for the 6th district be drawn by next month. Free and fair elections are the very foundation of American democracy and the most basic promise that those in power can pledge to the citizens we represent. This unanimous ruling was a victory for those who value fairness and balance in our political system. For the past three years, our administration has pushed for comprehensive, nonpartisan redistricting reform that would remove partisan politics from the redistricting process. This is supported by an overwhelming majority of all Marylanders. Please do not hide this legislation in a drawer again this year. Listen to the will of the people of Maryland and finally bring this bill to the floor of both chambers for an up or down vote. We enacted the most sweeping criminal justice reform in a generation. Together we have worked to break the cycle of incarceration and reduce our prison population more than every other state in America. But stopping these repeat violent offenders will take a different approach. We were all heartbroken by the story of Taylor Hayes the 7-year-old second grader who lost her life after being shot in the backseat of a car in Baltimore City. Then, just a few months later, we were stunned by the jarring image of a child’s doll lying in the street surrounded by crime scene tape and horrified to learn that Taylor’s 5-year-old sister, Amy, was the one shot in that incident, caught in gang crossfire. People who live in Baltimore don’t feel safe in their own neighborhoods, and citizens all across the State are outraged by the daily reports of this rampant gang violence. We launched an aggressive, coordinated surge to back up the beleaguered City police force. We sent 500 federal, state, and local law enforcement officers into the City and made 1,900 arrests. A few weeks ago, we announced a new comprehensive violent crime plan, which includes the opening of a Violent Crime Joint Operations Center and a new strike force consisting of more than 200 additional law enforcement personnel from 16 federal and state law enforcement agencies as well as local partners from the City and surrounding jurisdictions. And, other proposals, including assisting the City in recruiting and putting more officers into the community. But all of these efforts won’t be enough if we can’t keep these repeat violent offenders off the streets. Sixty percent of those convicted of gun crimes in Baltimore City do not serve any serious jail time and are simply released to commit violent felonies again and again. Much of this violence is the result of the opioid crisis raging across our nation. I was the first governor in America to declare a state of emergency, and we committed $800 million toward fighting the heroin, opioid, and substance abuse epidemic from all directions with a multi-pronged approach focused on prevention, education, treatment, interdiction, and enforcement. While we have bent the curve downward on prescription opioid and heroin overdose deaths, an even more deadly drug, fentanyl, is infecting and poisoning America. Too many of us know the devastation caused by heroin and opioid addiction. Under the surface, this crisis is destroying lives and tearing apart families and communities. This is a fight worth fighting, but it will take all of us - federal, state, county, municipal, and community leaders - working together with an all-hands-on-deck approach in order to save thousands of lives. When it comes to the issue of healthcare, Washington has continued to fail, but Maryland has continued to lead. We launched what has been called “one of the most aggressive efforts in the country” to protect the insurance exchange from collapsing. We pioneered a Total Cost of Care Medicare Model Contract, the only one of its kind in the nation. Together, we enacted landmark legislation to stabilize the individual marketplace and to create an innovative reinsurance program in our state. Thank you for rising to the challenge and working together with us to stop the 50 percent increases in insurance rates to instead achieve lower rates for the first time in a decade and to protect the coverage of hundreds of thousands of Marylanders. Thank you for rising to the challenge and working together with us to stop the 50 percent increases in insurance rates to instead achieve lower rates for the first time in a decade and to protect the coverage of hundreds of thousands of Marylanders. My experiences over the last four years have blessed me with optimism, not burdened me with dread. And I know from personal experience that hope - not fear - is the most powerful emotion and the author of humanity’s greatest achievements. While partisanship, dysfunction, and gridlock have become commonplace just down the road in Washington, here in Annapolis, we have chosen a different path. We have been standing up for that exhausted majority who are just sick and tired of all the angry and divisive politics. What they really want is for their elected officials in both parties to put an end to this culture of intolerance, intimidation, and inaction and just get to work and get things done. Four years ago when I first addressed you, I said that “no problem faces us that hard work, honesty, and courage cannot solve if we work together.” That remains as true today as it was then. So let’s keep putting the people’s priorities before partisan interests. Let’s continue to deliver real results for the people who sent us here. Let’s keep changing Maryland for the better and continue setting an example for Washington so that America can once again set an example for the world. Thank you, and may God continue to bless the great State of Maryland.